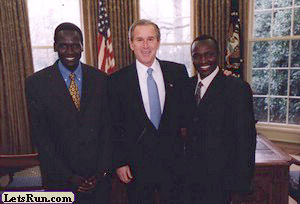 "Plus, unlike most of the LetsRun traffic, I never felt comfortable running long distances. Remember, I played soccer at a top competitive level for 15 years and was a starting point guard at Jesuit. I could dunk a basketball my freshman year in High School at 5'9" ... 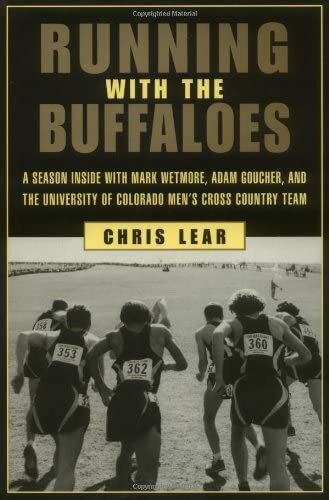 So running track was tertiary, and it took some lobbying by our athletic department to convince me that I should dump other sports I knew I could compete in at the college level to pursue the nerdiest endeavor of them all - Cross Country. Not only was it the nerdiest gig on one of the most talented sports campuses in the country but it proved to be the most difficult, a true test of will and pain tolerance, without the luxury of the stadium, the gym, the crowds, or the cheerleaders. It proved to be the best decision I ever made athletically." 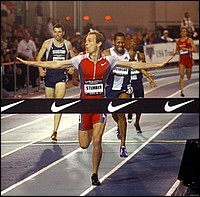 - Former Stanford star and 2000 US Olympian Michael Stember talking in a LetsRun.com exclusive about how he got serious about running late in HS. Stember, now a successful solar energy executive in California, shares his insight into training (and overtraining), the inner-city school problem, renewable energy and explains why it will be hard for him to win his CharityBet and break 18:00 for 5k. Who is the fastest african american marathoner born in United States? Washington Post Looks At How Seb Coe Is Getting London Ready For 2012 In Midst Of Economic Meltdown "If you are Sebastian Coe, the famous former British miler who is now heading the committee in charge of next summer's London Games, you don't try to top the 2008 Games in Beijing. Instead, you attack the Olympic challenge like you did all of those gritty middle-distance contests in the late 1970s and early '80s. They required tactics as much as pure speed, and sometimes weren't quite as fast as expected, or as pretty." NY Times: Tyson's Gay's hip impingement or bone shaving surgery is popular but does it work and is it necessary? Delaware Runner Wins National Club College Individual Title The UD program was cut this year. Illinois (87), Iowa State (115) and Virginia (128) were the top men's teams. Must mean they have lots of walk-on talent but strict Title IX restrictions. South East Asian Games Recap: Thailand Dominates The 800 Vietnamese national record is now 1:49.42. IAAF Head Lamine Diack Laughs At Bribery Investigation He says the big money he got in 1993 was because he needed help as his house had been burned down with his family inside. Lord Moynihan, The Chairman Of The British Olympic Association, Says Brits Have Right To Have Stiffer Drug Bans "The system put in place by WADA has failed to catch the major drug cheats of our time. The likes of Marion Jones, many cyclists and the BALCO operation are only a few of those who have been tracked down and prosecuted, not by WADA but by the law enforcement officers. So now is a time for change. Now is a time for informed review." More Lord Moynihan "We now have a situation where drugs cheats will be able to compete in London 2012," Moynihan said. "We must decide: is the outcome we want a watered-down, increasingly toothless gesture towards zero tolerance?" The Guardian Asks What Makes Sprinters & Usain Bolt Great And Declares "It's hard to imagine a white sprinter climbing on top of the Olympic 100m podium." The article quotes great coach Dan Pfaff asking the following question. "When he gets to 50m there's not usually a lot of traffic around him, so it would be interesting to see if he got to 50m, 70m, even 80m and three guys were still with him. Would he run a crazy time or would he fold?" Michael Johnson Says Bolt Could Be 400m WR Holder But Thinks His 100 And 200 Will Struggle If He Trains For 400 We disagree with this statement. "But he can't just step onto the track and run a 44 or a 43-second split just off 100 and 200m training." We guess he forgot about the 43.58 that Bolt ran back in 2010. 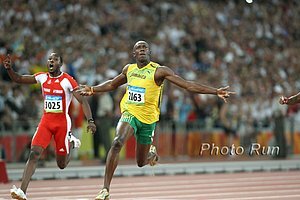 Yohan Blake Says Winning Medals, Not Beating Training Partner Usain Bolt Is Focus The article also states that Bolt admits Blake's work ethic is way bigger than his. In fact, Blake was late for the IAAF awards show as he was working out. Carl Lewis Says London Is Great, But ... "London of course is a great destination for the '17 Worlds but, as usual, we knew it was a backroom deal." Meb Says Of Olympic Trials Competitors: "They Better Be Nervous." Cool Video Board: Race Ryan Hall At NYC Subway Stop We saw this on RunnersWorld but Gizmodo and Reddit have picked it up and the YouTube video has over 200,000 views. 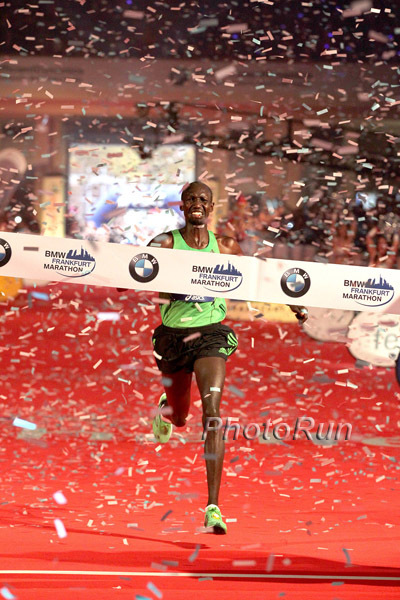 Kenyan Press Asks: Was Vivian Cheruiyot Cheated Out Of World Athlete Of Year Award? 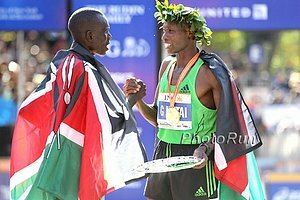 It's easy to say "yes" as Cheruiyot won three world titles, but Pearson had an almost undefeated season. Usain Bolt And Sally Pearson Are Surprising 2011 IAAF Athletes Of The Year And $100,000 Richer Vivian Cheruiyot won just about everything she ran but it wasn't enough. Yohan Blake was pretty damn good, but journalists must have had trouble giving it to a guy they figured would lose if he raced Bolt. *LRC DIII Contest Who says we don't love you. Wisconsin's Mick Byrne Tries To Get Rid Of Favorite's Tag "Certainly last year's champion, Oklahoma State, two-time champion Oklahoma State, I mean, on paper, everybody knows they're certainly the team to beat." Oklahoma State's Dave Smith: "This will be our most difficult route to another potential championship, but I believe in this team to get the job done." Mark Wetmore Pleased With Colorado Team Chemistry: "We believe in the concept of synergy." One We Missed: Lananna Says Oregon Team Found Out About Lukas V's Departure Via Press Release - Says He Tried To Talk Him Out Of It "Of course. I tried to make sure all sides of the equation were represented fairly. As any adult, I try to provide young men and women with sound, solid, objective, rational, non-emotional decisions about what their options are. He is a talented young man with a great future. I do feel he will come to grips with all of this, and for the sake of track and field, and for his sake, I hope the door stays open for him to come back to track and field, whether it's at Oregon or some other school." Former Wisconsin Runner Ryan Craven Thinks Mick Byrne's Relaxed Approach Is Ideal For NCAAs The former Badger who ran for both Mick Byrne and Jerry Schumacher has written an article that has caused the message board to explode as he compares the styles of the two coaching icons and comes to the conclusion that he thinks the more relaxed Byrne style is better for NCAAs. A few former Badgers, including Simon Bairu and Chris Solinsky, have come to Schumacher's defense and all hell has broken loose. LetsRun.com co-founder Robert Johnson tried to calm everyone down by chiming in with a post saying different things work for different teams and situations. Collis Birmingham Talks About Altitude Tents, His New Training Location And Goals For 2012 We loved his goals, "Olympics, PBs and to learn Spanish." Racewalker Justifiably Gets Feature In New York Times: US Female Racewalker Will Compete In Men's Olympic Trials As There Is No Men's 50k Racewalk Erin Taylor-Talcott's time is good enough to get her into the Trials, so she should compete. That being said, we have a solution for the 50km gender disparity - get rid of it for both sexes. Japanese Comedian/Now Cambodian Citizen Hiroshi Neko Runs 2:37:39 PR - Olympic Status Now Unclear That's a man's time. 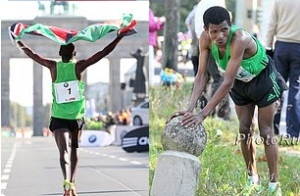 Elite Field For Fukuoka Marathon Is Released - Includes Zero Invited Ethiopians or Kenyans The field does feature Alistair Cragg and Andrew Lemoncello and a few Japanese-based Kenyans including Japanese 10,000 all-comers record holder Josphat Ndambiri, who smoked world champ Jeilan on Nov. 3rd. More Marathon News: Meet "The Other" Hansons-Brooks Female Runner - 34-Year-Old Dot McMahan The mom deserves some props as she's run 2:31. 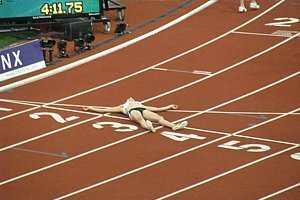 We 100% Agree: NYTimes: Complicated Training Plans, Focus On Foot-Strike Often Turn Off Beginning Runners - For Beginning Runners, Advice Can Be a Hurdle As one man said, "(Training plans) are so complicated.I thought, 'Oh my God, it's just running.'" Heather (Dorniden) Kampf Talks About The Most Amazing Race Ever Put On YouTube, Pan Ams And More If you are having a bad day and think you can't accomplish something, please watch this video. Any U of O people want to speak their mind about Lukas? Jordan Hasay On Regionals: "I never defend stuff, so it's good for me to do that." Heather (Dorniden) Kampf Talks About Pan Am Games And Her YouTube 600m Comeback If you've never seen the video, it's a must-watch. Time Is Running Out First 50 in the LetsRun.com Puma Challenge to be selected this week. Want a free pair of Puma Faas shoes? Tell us why you're worthy of the challenge.